The United States is in the mortgage business and in a big way. I have had to repeatedly remind myself that Uncle Sam’s reach in mortgage lending goes far beyond Home Equity Conversion Mortgages. At times many reverse mortgage professionals may lament our industry’s near total dependence on the federal government when in reality the majority of the housing market is regulated and ultimately backed by the taxpayer. The HECM is no exception. Not long ago we had an experienced and well established group of people at HUD focused on the HECM program. Today that experience other than that seated in the FHA Commissioner has been at least significantly reduced. 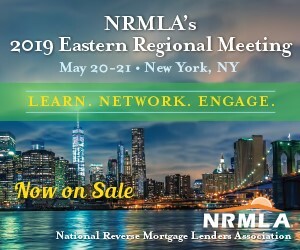 NRMLA on the other hand is living in a world of imagined opportunity being fulfilled in the remainder of fiscal 2019. So what is being said and what are the facts? Yet just looking at the FHA HECM Summary Endorsement Reports for March 2019 and March 2018, endorsements were just 15,618 through the first six months of fiscal 2019 but 29,832 for the first six months of fiscal 2018. That is a 47.6% drop in fiscal 2019. How is that drop SLIGHT? Dr. Miller was happy to tell the audience that the February 2019 case number assignment count is almost 5,000. Yet using 1) the four month lag rule for the average HECM to go from case number assignment to endorsement and 2) a conversion rate of 66%, the total endorsements projected for the third quarter of fiscal 2019 will be about 8,000 endorsements. Based on the projected endorsements for the third quarter of fiscal 2019, the first nine months of fiscal 2019 are expected to produce about 23,600 endorsements versus 39,374 endorsements produced in the first nine months of fiscal 2018. Without the case number assignment counts for March, April, and May 2019, the basis of predicting endorsement counts in the last three months of fiscal 2019 (ending September 30, 2019) becomes unreliable. Still it is unlikely that in the last quarter of fiscal 2019 there will be anything close to the 25,759 endorsements estimated as needed to make the number of HECMs endorsed in fiscal 2019 equal to the 48,359 HECMs endorsed in fiscal 2018. Based on reasonable and realistic estimates, it is very likely that not only will fiscal 2019 be among the three worst percentage losses for endorsements when compared to the total endorsements for the prior fiscal year but it is also likely that the endorsement total for fiscal 2019 will produce the highest percentage loss for any fiscal year before it. It is also highly likely that the combined percentage loss for fiscal 2018 and 2019 will be the highest (or second highest) for any two consecutive year period in the history of the industry. Endorsements slightly down in fiscal 2019 when compared to fiscal 2018? Hardly. Worse this shows inexperience at HUD at the time, EXPERIENCE is most needed. As to the remainder of 2019 being something to look forward to, well, that is the problem with ultra optimism. My personal confidence that the current fiscal year will result in a 0.8% positive cash flow is not high. The question that remains unaddressed is if HUD has the experience, capacity, willingness, and unbiased character to provide the President an unbiased assessment he is requesting.